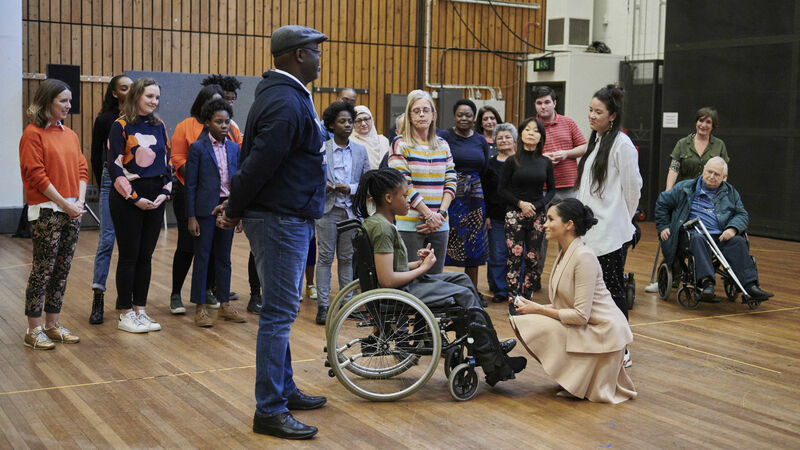 The Duchess of Sussex visited the National Theatre on Wednesday 30 January 2019. The Duchess is our new Royal Patron, the Patronage having been passed on by Her Majesty The Queen. 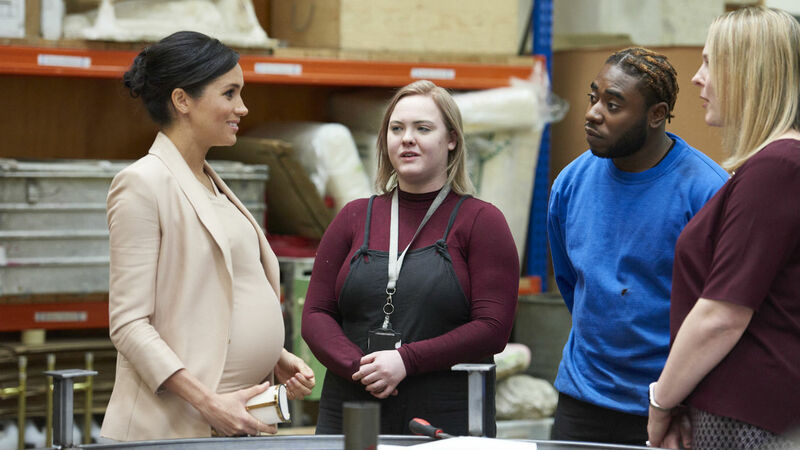 The Duchess is a strong believer in using the arts to bring people from different backgrounds and communities together, and we were excited to share the work we do with her and introduce her to some of the talented teams and apprentices working behind the scenes at our South Bank home. Last year we launched Public Acts, our new initiative to create extraordinary acts of theatre and community. Our first Public Acts production was a new musical adaptation of Pericles performed on the Olivier stage by a company of over 200 people of all ages recruited through our community partners. They were joined by seven cameo performance groups representing the cultural diversity of London, as well as a small cast of professional actors and musicians for three nights of spectacular performances. We were delighted to introduce The Duchess to Emily Lim, Director of Public Acts, and Blessing, Percy and Sharon who were in the Pericles company. Our next Public Acts production will be a musical adaptation of As You Like It at Queen’s Theatre Hornchurch in August 2019. Above you can see The Duchess meeting Technical Apprentices Olivia and Kelsey and previous apprentice Tamykha, who are working on some rather fancy chandeliers for Tartuffe in our Assembly Area. Olivia has recently decided to specialise in automation, and has worked on Hadestown and I’m Not Running. Kelsey is currently in the Lighting Department and has recently worked on War Horse; he is now working on Follies. Tamykha completed her apprenticeship at The New Wimbledon Theatre in 2014, and joined the National Theatre in 2016. She has also worked on the West End transfer of Nine Night and Tina: The Musical. The Duchess also met Sophie, our current Metalwork Apprentice. Sophie has been with us for four months and is our first female metal apprentice. Camile successfully completed his metal fabrication apprenticeship last year and is now one of our Metalworkers. His job involves building and welding metal frames for the main structures of scenery used for plays. Camile and Sophie are with Kate John, Head of Construction. We also run apprenticeships in Carpentry and Scenic Art. Our current Carpentry Apprentice is Joel, who started his apprenticeship in 2017. He is accompanied by Laura, our former Carpentry Apprentice who is now a National Theatre carpenter and Ken Rose, Head of Carpentry and Metal. Sophie is our first ever Scenic Art apprentice. Scenic Artists paint everything you see on stage, and so far Sophie has learned many scenic painting skills including wood graining, marbling, portraiture, texturing and gold leafing. She painted the reproduction of 'Girl with a Pearl Earring' which you can see in this photograph. 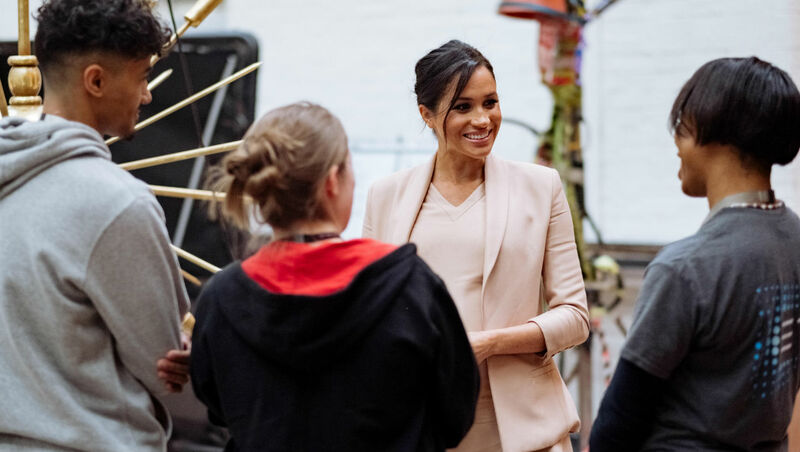 Lisa Burger, Executive Director of the National Theatre, spoke to The Duchess of Sussex about the reach of our national work before introducing her to Jenna Omeltschenko, Touring Partnerships Manager. Jenna looks after the learning and education work on the National Theatre’s touring programme across the UK. She recently worked with over 60 schools across the UK who hosted our schools tour of The Curious Incident of the Dog in the Night-Time. Our Primary Schools Programme reaches across the UK. It comprises a range of projects including Let’s Play, which offers schools everything they need to stage great theatre productions, and an annual schools tour of plays by Shakespeare, specially adapted for primary age children. Last year the programme worked with almost 10,000 children nationwide. Above you can see The Duchess watch a special performance of War Horse, created by Year Six pupils from Edith Neville Primary School in Camden. They created this in November 2018 to mark the centenary of Armistice Day. 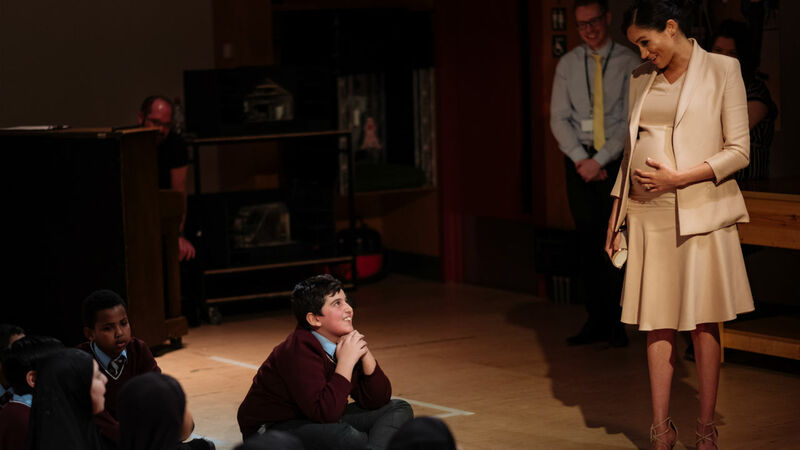 As part of this project primary schools were invited to see War Horse at the National Theatre and, in partnership with the Imperial War Museum, take part in a creative programme to enrich children’s understanding of World War One. Afterwards, The Duchess spoke to pupils from the school and congratulated them on their performance. It’s been a great pleasure to welcome The Duchess of Sussex to the National Theatre and we look forward to sharing more of our work with her again in the future. Some of these photographs were shared with us by Kensington Palace. You can see more from The Duchess' visit on Instagram, Facebook and Twitter.